Teapot, milk and sugar bowl - sterling silver. 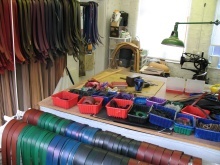 1981 onwards, I have been in full time business running a jewellery and silversmithing workshop, and since 1993 a leatherwork and metal workshop. 2001 - '07, part-time teaching BA Metalsmithing & Jewellery. '07 - '10, MA Design Courses visiting lecturer University of Central Lancashire. Lord Dainton, the Chancellor of the University of Sheffield commissioned a silver medal, it was the premier medal of achievement presented annually. Helen Sharman, the first British astronaut received the medal during 1991. Sheffield Assay Office commissioned many of the silver pieces listed for their permanent collection. Lord Dainton, the Chancellor of the University of Sheffield commissioned a bronze medal during 1997 to celebrate the centenary of the sealing of the royal charter, joining Firth College, the Medical School and the Technical School becoming the University of Sheffield. Wimpole Hall, National trust property. Solo show of metal vessels. The Curve Gallery, Sheffield. Solo show of metal vessels. 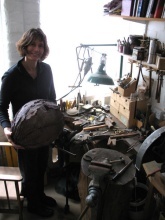 Living Metal Project - Silversmithing Hidden Histories. Millennium Galleries, Sheffield. Art Workers Guild 125 Years, published by the Unicorn Press. The book is a photographic record of Guild members in their studio's and workshops alongside descriptive text.